Miles Krassen (l), L.E. 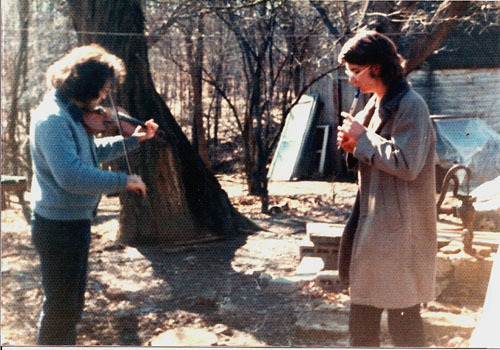 McCullough (r) – Bloomington, Indiana, 1974, playing a wedding in the woods. The altar was the tree at left … kind of a druid-thing. L.E. McCullough has been playing Irish music on the tinwhistle since 1972. when he had the unbelievable good fortune to meet and hear incredible Irish traditional musicians in Ireland and America who generously passed down their knowledge and wisdom about this amazing idiom. He’s Been Here (played at The White House), Done That (made lots of albums, books, videos) and currently lives in Woodbridge, New Jersey. He is possibly best known for authoring an instructional manual, The Complete Irish Tinwhistle Tutor, in 1976 — which at the time was the very first publication that got deep into whistle ornamentation, breathing, articulation, variation. It went on from there. Everything you want to know about all things L.E. McCullough are found at http://www.lemccullough.com. L. E. McCullough is the man . I chose to play woodwinds, but the penny whistle spoke to me . I didnt choose it . It chose me , but without L.E. and his books I would have never progressed .And for that , I thank you.